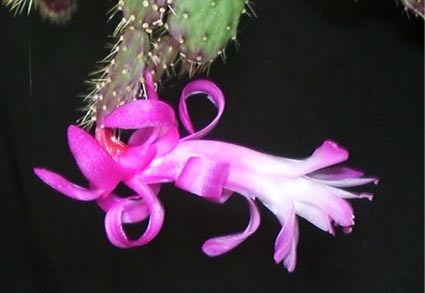 Among the four botanic Schlumbergera of which I speak, it is the one I know the least because I am very badly able to cultivate it: it rots on its own roots and the grafted specimen which was going to flower died in bud. A German friend gave me another one, but it has not yet bloomed. The photograph of the flower I present was communicated to me by Pieter Colpaert (link to his site available on my links page). I cordially thank him. Schlumbergera opuntioides was described in 1905. 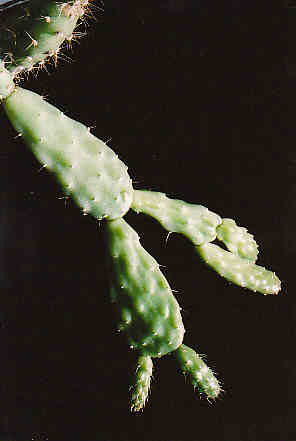 Its stems look like those of an Opuntia ; this point explains the origin of its name. They are from 15 to 70 mm long and 5 to 30 mm wide. They have a variable spination. The bloom is zygomorphic, it’s approximately 6 cm long and 4.5 cm wide. I never personnally observed it but I haven’t given up …. The blooming period in the northern hemisphere takes place from March to April. The hybrids of Schlumbergera opuntioides and Schlumbergera truncata or an hybrid of the group x buckleyi, make up the group Schlumbergera x exotica whose stems are cylindrical and ribbed. Their cultivation is for me difficult with much falling of the stems as sudden as unexpected.